When I worked in the museum industry several years ago, one of my bosses was heavily involved in the art auction business (in addition to his responsibilities at our museum). This boss worked as an on-call consultant for a major auction house, and would often tell me stories about the dog-eat-dog attitude within the art market. I remember one story that involved an auctioneer who fell into a coughing fit at the climax of one lot sale, but it quickly became apparent that he was stalling for time: there was an agent on the phone who was working to secure a higher bid for the painting. Anyhow, I think that listening to these stories piqued my interest in the art market, which is why I wanted to read Don Thompson’s book, The $12 Million Stuffed Shark: The Curious Economics of Contemporary Art. The book discusses the everything you wanted to know about the art market: auction houses, prices for art, art as an investment, galleries and dealers, etc. I have to admit, though, the middle of the book was rather uninteresting. Thompson focused a lot of auction prices and technicalities. I think this information would be very useful to anyone who is interested in buying or selling art, but it wasn’t very compelling from a historical standpoint. Perhaps I shouldn’t have set my expectations too high – I knew that Thompson was an economist (and not an art historian) when I started to read the book. The ending of the book completely redeemed itself, though. Thompson devoted a whole chapter to how art crime (especially forgeries) affect the art market. One interesting story was from May 2000, when Christie’s and Sotheby’s realized that their most recent auction catalogs were offering the exact same painting for sale, Gauguin’s Vase de Fleurs (Lilas), 1885. Obviously, one of the paintings had to be a fake. The auction houses showed the works to a specialist, and it was later determined that Christie’s was selling the copy. The FBI ended up getting involved and a complex art scandal was unearthed that involved Ely Sakhai, the owner of the original Gauguin painting. Anyhow, I don’t know if I’ll read this book again, but I think it is a good resource for the art world. I’d recommend this book to anyone who is seriously interested in buying or selling contemporary art. This is my last book for heidenkind’s Art History Challenge. 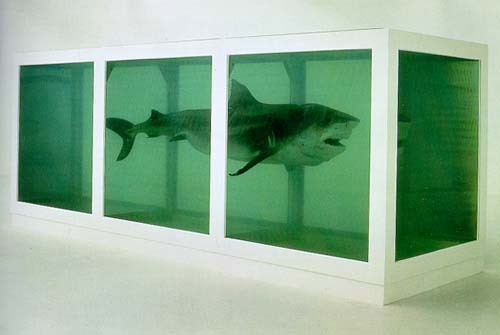 1 Don Thompson, The $12 Million Stuffed Shark: The Curious Economics of Contemporary Art (London: Palgrave Macmillan, 2008), 2, 63. Heidenkind’s Art History Challenge ends this week, and I am finishing up the last two books that I selected for the challenge. This morning I finished Sue Roe’s The Private Lives of the Impressionists, which I have been trying to read for several months. It’s not that Roe’s book is boring or bothersome – but it wasn’t compelling enough for me to read in a single sitting. Ironically, I wonder if the book wasn’t amazingly compelling because I’m an art historian. I wasn’t waiting on edge, wondering what was going to happen to the Impressionists, because more-or-less I already knew. 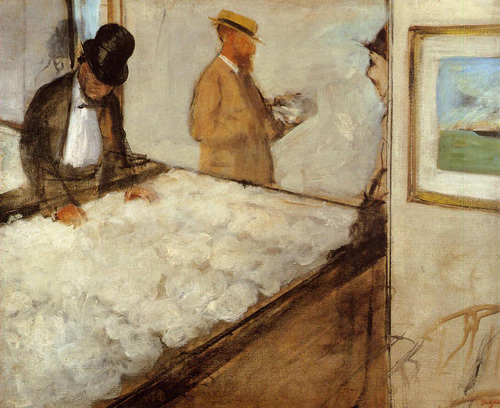 The book is dedicated to the personal and professional lives of several Impressionist artists: Manet, Monet, Pissarro, Cezanne, Renoir, Degas, Sisley, Morisot, and Cassatt. Roe’s writing style is very informed, but also lively and engaging. I thought that she gave fairly equal treatment to all of the artists mentioned, with the exception of Alfred Sisley, who didn’t receive a lot of discussion (which I would expect, since he’s not very well-known). I think this might be my new favorite work by Degas. It’s fun and interesting subject matter, and I love the white, fluffy cotton. Overall, Roe’s book was pretty good. It’s not the most compelling thing that I have ever read, but it was interesting to learn more about the personal lives of the Impressionists. I’d recommend this book to anyone who wants to learn more about the Impressionists, but I do think it would be easier for the reader to be somewhat informed about Impressionism before reading Roe’s book. Have you read The Private Lives of the Impressionists? Did you like it? Last week I had a student remark that the two circles in Lorna Simpson’s Untitled (2 Necklines) (1989, shown left) look like a pair of eyes. I’ve been thinking a lot about this comment lately, particularly because I think it ties into Laura Mulvey’s theories regarding the male gaze and fragmentation. Basically, the two circles eyes make the viewer especially conscious that he (the gendered pronoun is intentional) is fragmenting, cropping, and fetishizing the woman with his gaze. It’s interesting to note that these eyes detract attention from the fact that Simpson (and Simpson’s camera) have actually done the fragmentation of the image. And there are other interesting parallels which can be drawn between human eyes and cameras: eyes have a limited amount of scope within their visual field and crop things naturally, just as a camera has to crop images because of the limitations of the camera lens. I like that Simpson includes the word “eye” in one of the text boxes between the circles. I realize that this group of words also can also be associated with discrimination, slavery, and lynching – not just the objectification of women. But it’s interesting to read the word “eye” and between two circular eyes. And if you stare at this work of art too long (as I have been doing this morning), the column of words become the outline for a nose, the dark skin looks like pupils, and the white clothing looks like the whites of eyes. Could we say, then, that this piece is an actual visualization of the male viewer? Ha ha! Okay, probably not, but it is kind of interesting to see a little “face” emerge in Simpson’s work. I just took this fun art history quiz, which revolves around portraits from the St. Louis Art Museum’s collection. I missed one question – I didn’t bother to read the captions and mistakenly attributed a Gauguin painting to Van Gogh. If I had taken more time, I would have gotten them all right. Maya Lin and "Eleven Minute Line"
Last week, I heard Maya Lin speak at the university where I work. Her lecture was uncannily appropriate, since I had planned for my students to learn about Lin last week (before realizing that she was coming to speak). Minutes after the lecture began, I had two distinct impressions: 1) Lin is extremely tired of speaking about the Vietnam War Memorial and 2) Lin has a lot of flexibility in her career, since she established fame and recognition so early in life. Really, because Lin already has public attention and a fan base, she can create whatever she wants; she isn’t like many other contemporary artists, who seem to feel the need to be shocking or controversial in order to get attention. My suspicions regarding the connection between Eleven Minute Line and the Serpent Mound were confirmed during Lin’s lecture. The artist is from Ohio, and she has always been struck with the story of the Serpent Mound. 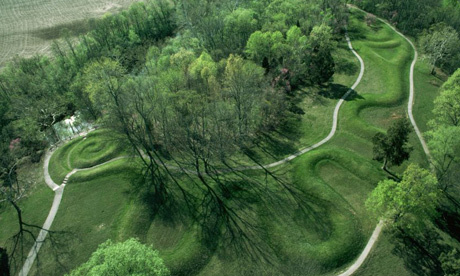 When Europeans came to America and discovered the Serpent Mound, they concluded that an earlier group of Europeans must have made the structure and then traveled back to the Old World. Basically, these European explorers could not conceive that Native Americans could have built something so complex and monumental. Lin decided add a subtle element of irony with Eleven Minute Line by turning the tables a bit: she brought a design that was inspired from the New World back to the Old World (i.e. Sweden). It was a real privilege to hear such a well-known artist speak. I was glad that she discussed her more recent art, too. Are you familiar with Maya Lin’s work (aside from the Vietnam War Memorial)? I think her interests in environmental/landscape issues are really interesting.